A scenic vertical picture taken along the Highway 1 coast in California. 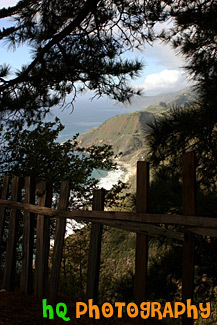 This picture was taken looking down at the Pacific Ocean through a fence and trees on a hill. Hills along the coast are seen in the background.